Scott Chambers utilizes pure, vivid colors to create super-life-sized flowers, which he carefully composes into arrangements in handblown glass vases. Inspired by natural forms, colors and textures, Chambers takes artistic license in interpreting the beauty and refinement of real flowers, rather than simply creating glass replicas. He creates some flowers in realistic colors, others in hues that are purely fanciful. Currently, the sculptural arrangements he creates include Calla Lilies, Daylilies, Cattails, Old Fashioned Roses, Siberian Irises, Rhododendrons, Daffodils and mixed bouquets. After a late start at 40 years of age, Chambers took to glass with a passion that propelled him into mastering the most complex techniques of the medium in a few short years. As a native of the Pacific Northwest, now recognized as the world’s leading center of glass art innovation, Chambers has had excellent access to learning about glass. He studied at Seattle’s Pratt Fine Arts Center and at the world’s most prestigious and highly regarded glass school, Pilchuck, founded by Dale Chihuly in Washington State. 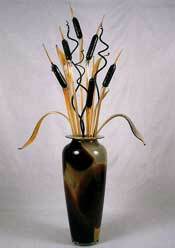 Having learned the classic techniques, Chambers is proudly self-taught in making flowers, an area that only a few contemporary glass artists have mastered. He sculpts each flower individually from molten glass, using many of the ancient techniques of offhand glassmaking, no molds and only a few simple tools.Scott Chambers' work has been shown at major galleries, museums and juried exhibitions throughout the United States.